The first day of the Oahu Fringe Festival kicked off with performances ranging from stand-up comedy and the spoken word to innovative musical and dance performances at three venues: Ong King Arts Center, The ARTS at Marks Garage and NextDoor. At NextDoor, the talented ladies of Samadhi Hawaii Aerials and Shakti Dance Movement wowed the audience with an aerial burlesque and tribal-fusion belly dance show. The performance was a collab project between the two dance companies with special guests from Volary Aerial Burlesque gyrating high above the crowd. 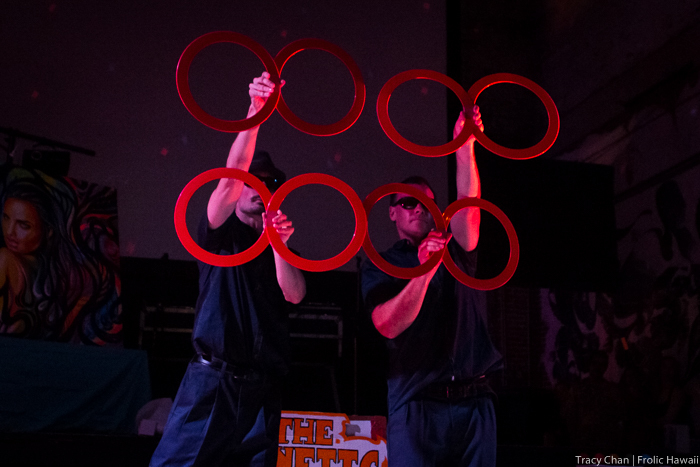 The closing show by duo Kinetic Flow was the debut of their production “Go with the Flow,” and it received an enthusiastic standing ovation. The two men play janitors at a circus on opening night, but its cast is mysteriously missing. This forces them to take the place of the missing cast members as Russian Strongmen, Wild West whip experts, telepaths, magicians, jugglers and more. The two pulled off every act flawlessly, and used this performance to showcase their many talents with a perfect mix of physical comedy and good timing. The Fringe Festival continues this Friday, Saturday and Sunday at all three venues. For tickets and a complete schedule of acts, visit www.oahufringe.com.